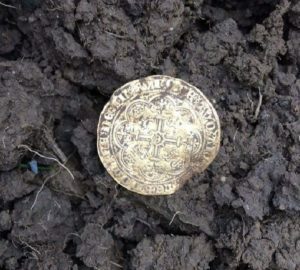 Noble – this is the name of the first mass-produced English gold coin. 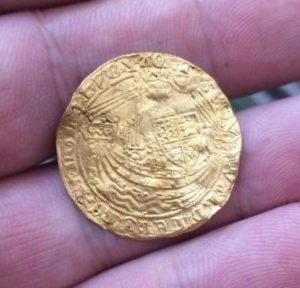 This huge coin contains over 90% gold!? The medieval system counted one noble to be just as much worth as six shillings and eight pence or 80 pence, or 1/3 pound. 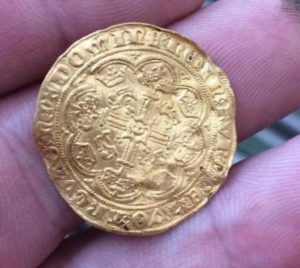 This magnificent coin appeared in the 1344-1346, the years of the reign of King Edward III and later kings used this coin for over a hundred years. The inscriptions on the early coins were as follows. The side with the King with sword and shield on the ship says: EDWAR DGRA REX ANGL Z FRANC DNS HYB (Edward by the grace of God King of England and France Lord of Ireland). The reverse side says: IHC AUTEM TRANSIENS PER MEDIUM ILLORUM IBAT (But Jesus passing through their midst went His way) – a quote from the Bible. So keep in mind, if the ground is not yet frozen where you live, or there is snow on the ground, there is no reason to not go out detecting! Maybe you will find such a coin too! Want to read about more interesting finds? I keep them all here!